Ping’s New York Half Sour Pickles - Jason Alter Ph.D.
John Fastramp and his friends are usually in a pickle, so ‘pickles’ seemed to be appropriate for our first Fastramp-themed recipe. Ping is a significant character In the John Fastramp action-adventure series (grades 3-6). Among other things, Ping owns many restaurants including her American Deli which features, among other things, homemade half sour pickles. When she is not racing around the world with John, Tom, and Gwen, Ping develops new recipes for her culinary empire. These recipes are the creation of Lisa Alter as they would be prepared in Ping’s eateries and are provided for your use. I’ve been missing my Ba-Tampte half sour pickles since I moved to CA from the NY, so I finally decided to try my hand in making my own. 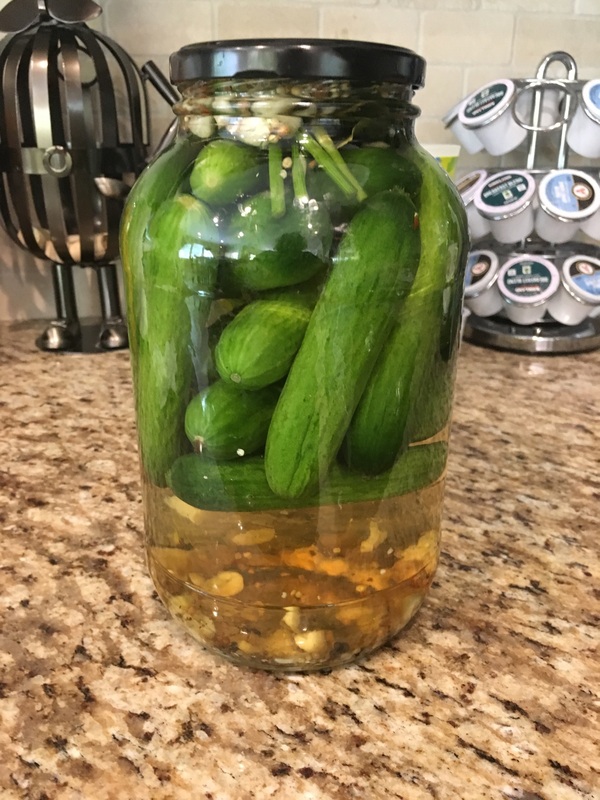 After doing my research, I learned that these pickles are cold, fresh packed and not vinegar based and they don’t need a home canning system. It’s the reason that Ba-Tampte can only be found in the refrigerator section. These NY Half Sours will need to stay in your refrigerator too (unless you eat them all in one sitting!). Now, unless you are good about labeling and dating your containers and jars, you may be wondering how you can tell how fresh your batch of pickles are. As these pickles age, the cucumbers will get softer, and their color will turn from a bright green to a darker green. Their flavor will also become more intense and a little more like sour dills. After eating a few batches, you’ll likely find the “age” that best suits your taste. These pickles are very easy to make. In just a few days, you too can be enjoying your very own NY half sours! And, don’t be afraid to experiment with whatever additional spices tantalize your pallet. Many pickling spices also include allspice berries, cinnamon sticks, whole cloves, and/or dill seed. Put the cucumbers in a ½ gallon jar (any jar will do). Dissolve the sea salt in the water. Grind up the coriander, mustard seeds, peppercorns and red pepper flakes. Don’t grind too fine, just enough to release the aromatics. A mortar and pestle are easiest for lightly grinding spices (don’t use a spice grinder as they will be ground too fine), but a rolling pin rolled over a Ziploc bag also works! Pour the salt water mixture into the jar. Depending upon how full you packed your cucumbers into the jar, all of the salt water may not all fit. Just be sure that all of the cucumbers are covered. Add the fresh dill on top and the additional coriander and peppercorn seeds and cover the jar lightly. Let the jar sit in a cool, dark place on your counter for 48 hours. Seal jar, refrigerate for at least another 2 days and enjoy! John Fastramp note: Dakota 3000 challenge, Chapter 2. Ping prepares quite a lunch spread, which included these pickles. These are featured in her American restaurant. ← We had a spaceship in 1968. No, not Apollo. Yurts and Genetics: who’s your daddy? We had a spaceship in 1968. No, not Apollo. Copyright © 2019 Jason Alter Ph.D.